This name uses Portuguese naming customs. The first or maternal family name is Vieira and the second or paternal family name is da Silva. 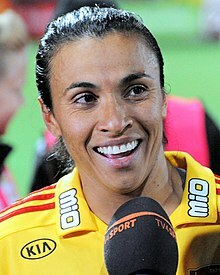 Marta Vieira da Silva (born 19 February 1986), commonly known as Marta, is a Brazilian footballer who plays for the Orlando Pride in the National Women's Soccer League and the Brazil national team as a forward. With 15 goals, she holds the record for most goals scored at FIFA Women's World Cup tournaments, ahead of Birgit Prinz and Abby Wambach, both with 14 goals. Marta is often regarded as the best female player of all time and was given the nickname "Pelé in skirts" by Pelé himself. She was named FIFA World Player of the Year six times, five of them being consecutive, from 2006 and 2010, and the latest one coming in 2018. She was a member of the Brazilian national teams that won the silver medal at the 2004 and 2008 Summer Olympics. She was also awarded the Golden Ball (MVP) at the 2004 FIFA U-19 Women's World Championship, and won both the Golden Ball award as the best player and the Golden Boot award as the top scorer in the 2007 Women's World Cup after leading Brazil to the final of the tournament. In January 2013 she was named as one of the six Ambassadors of the 2014 FIFA World Cup in Brazil, alongside Amarildo, Bebeto, Carlos Alberto Torres, Ronaldo and Mario Zagallo. She also appeared in the Sveriges Television television documentary series The Other Sport from 2013. In August 2016, Marta was one of the 8 to carry the Olympic Flag in the Olympic Games in Rio. As of 14 March 2017, Marta has become a Swedish citizen. She's stated that she'll keep her Brazilian citizenship. Marta was discovered by well-known Brazilian female coach, Helena Pacheco, when she was only 14 years old. After playing for the CSA youth team, Marta started her professional career at Vasco da Gama in 2000. After two years, she was transferred to Santa Cruz, a small club in the state of Pernambuco , where she would play for two more seasons, before defending Umeå IK of Sweden. Marta joined Umeå IK prior to the 2004 season during which Umeå reached the final of the UEFA Cup, winning 8–0 on aggregate against Frankfurt with Marta scoring three goals over the two-legs. In the league, despite amassing a total of 106 goals, which was 32 more than the Champions, Umeå finished second, beaten by a single point by Djurgården. Marta scored 22 league goals, and also got on the scoresheet at the cup final against Djurgården, scoring the only goal in a 2–1 Umeå loss. Her second season (2005) ended with Marta scoring 21 goals and with Umeå winning the league, having gone undefeated. Once again, Umeå were beaten by Djurgården in the cup losing by a score of 3–1 in the final; thus avenging a 7–0 league defeat to Umeå some three weeks earlier. In 2006, Umeå once again won the league without losing, and Marta, as in the previous year, was the league's top scorer with 21 goals. Umeå cruised to an 11–1 aggregate win over Norwegian side Kolbotn FK in the UEFA Women's Cup, with Marta scoring twice in both matches. For the third time in a row, she was on the losing side in the Swedish cup final when her side were defeated 3–2 by Linköpings FC. Marta in the 2009 WPS All-Stars match against Umeå IK. The 2007 season was a relatively successful for Umeå with the club winning both the league, in which they finished nine points ahead of Djurgården, and the Swedish Cup, beating AIK 4–3 in a match in which Marta scored a hat-trick, the last (winning) goal coming three minutes from time. Marta scored 25 goals in the league finishing one goal behind the top scorer Lotta Schelin. In the UEFA Women's Cup they reached the final for the fourth time but suffered a disappointment, losing 1–0 on aggregate to Arsenal. The 2008 season saw Umeå and Marta win another Swedish championship title. After the end of the season, speculation arose concerning the future of Marta and a couple of months later, on the day of the FIFA World Player of the Year Awards in January 2009, Marta announced that she would play for the American side Los Angeles Sol for the next three years. At the request of Marta, the Los Angeles side also purchased Johanna Frisk from Umeå IK, which led to a report by Swedish TV4 sports presenter Patrick Ekwall that Marta and Frisk were a lesbian couple. Both players denied this to be true. Marta's life and football prowess was depicted in the 2005 Swedish Television documentary "Marta – Pelés kusin" ("Marta – Pelé's cousin"). On the day she was named FIFA World Player of the Year in January 2009, Marta announced that she would be joining Women's Professional Soccer (WPS) team Los Angeles Sol for the league's inaugural season on a three-year contract. Of her signing, she said, "For me the most important thing is to be in a place where the best players in the world are playing and this is what they are trying to do here. The American League is being considered one of the best in the world, so I had to come now." Marta was the league's top scorer for the 2009 season with ten goals and three assists. The Sol were regular season champions and reached the WPS Championship Final, where it lost 1–0 to Sky Blue FC. During the off-season with Los Angeles Sol, she signed a three-month loan contract with Santos to play in the Copa Libertadores and in the Copa do Brasil, helping her club win both competitions, and scoring a goal in the Libertadores final and two in the Copa do Brasil final. In January 2010, the Sol ceased operations and the rights to Marta and her teammates were made available in the 2010 WPS Dispersal Draft. The rights to Marta were acquired by the FC Gold Pride as their first pick. She appeared in all of the Pride's 24 games and scored 19 goals, earning her the WPS MVP and WPS Golden Boot for the second year in a row. Marta also appeared in the WPS All-Star 2010, where she captained one of the teams as the top international vote-getter. She led the Gold Pride to the regular season championship and had two assists and a goal in the WPS Championship against the Philadelphia Independence, earning MVP honors. She became a free agent after the Gold Pride folded on 17 November 2010. On 16 December 2010, Santos presented again Marta . It was a two-month contract that could become a link of a year, but it did not. The board of directors has confirmed it is finalizing negotiations for the club to dispute the women's football league in the United States in 2011. However, pursuant to the competition regulation, the club would have only five Brazilian players – Marta and four. On 25 January 2011, Marta joined her third WPS team in three years, the expansion team Western New York Flash, who took over the third year of her contract with the Gold Pride. Marta's 2 goals and 4 assists were a key part to the 3–0–1 start for the team's 2011 season. Western New York Flash forward Marta helped her team to the Regular Season Championship title, scoring her tenth goal of the season in a 2–0 victory over the Atlanta Beat on Sunday, en route to earning her third consecutive PUMA Golden Boot award. The Brazilian soccer star edged out fellow Flash forward Christine Sinclair, in the tie breaker having a greater production rate based on goals per game average. As WPS cancelled the 2012 season, Marta decided to return to Damallsvenskan in Sweden. On 22 February 2012 she signed a two-year contract with Tyresö FF. Her extraordinary salary of about $400,000 per season was paid by external sponsors and not the club, its owners stated. Tyresö won the Damallsvenskan title for the first time in the 2012 season and Marta collected her fifth league winner's medal. Marta scored twice in Tyresö's 4–3 defeat by Wolfsburg in the 2014 UEFA Women's Champions League Final. Tyresö had suffered a financial implosion in 2014 and withdrew from the 2014 Damallsvenskan season, expunging all their results and making all their players free agents. The Stockholm County Administrative Board published the players' salaries, showing Marta was the highest earner at SEK 168 000 per month. As news of Tyresö's financial difficulties spread, Marta had been linked with a transfer to Avaldsnes IL. But the Norwegian Toppserien club's chairman warned that she would have to take a substantial pay cut. Paris Saint-Germain Féminines were also reported to have approached Marta and Tyresö teammate Caroline Seger. In July 2014 she signed a six-month contract with defending champion FC Rosengård in Sweden. While with the Swedish club, Marta won the Damallsvenskan league title in 2014 and 2015, the Svenska Cupen in 2016, and the Svenska Supercupen in 2015 and 2016. After Rosengard lost to Barcelona in the quarterfinals of the UEFA Women's Champions League, Marta joined Orlando Pride on a free transfer from Rosengard, which agreed to terminate her contract. Her new contract with Orlando is for two years with the option for a third. In her first season at Orlando, she finished second in the league in both goals and assists and was voted MVP by her teammates. The Pride ended the season in third place earning their first ever play-off appearance where they lost in the semi-finals to the Portland Thorns. On 26 July 2007, Marta and the Brazilian women's team beat the US U-20 national team to win the Pan American Games at the famous Estádio do Maracanã in front of a crowd of 68,000. She was compared, by the Brazilian fans, with Brazilian great Pelé, being called "Pelé with skirts." Even Pelé himself agreed with the comparison. Marta has stated that he called her to congratulate for the win and that she was extremely happy to hear that one of the greatest ever players followed her team's games. Afterwards the imprint of her feet was recorded in cement at the stadium, making her the first woman to be so honoured. Marta participated in the 2007 FIFA Women's World Cup with Brazil who strolled through the group stage, winning all three games with Marta scoring four goals. In the quarter final Brazil won 3–2 against Australia with Marta netting from the penalty spot. In the semi-final Marta scored twice as Brazil won 4–0 against the United States—the second goal scored in spectacular fashion. In the final Brazil lost 2–0 to Germany. Marta had a penalty kick saved midway through the second half, which would have tied the match. She finished the 2007 Women's World Cup as the winner of both the 'Golden Ball' as the top individual player and the 'Golden Boot' as the competition's top scorer with seven goals. Marta also played in the 2008 Summer Olympics, earning a silver medal. After her personal duel in the final with United States goalkeeper Hope Solo, a 1–0 defeat consigned Marta to her third consecutive runners–up medal in major international tournaments. Marta was part of the Brazil team at the 2011 FIFA Women's World Cup where Brazil was eliminated by the United States in the quarter finals. She recorded four goals and two assists in the tournament, to move joint top of the all–time Women's World Cup goalscorer list alongside Birgit Prinz on 14. It also earned her the Silver Boot as the tournament's second leading goal scorer. From her first touch in the tournament against Australia, Marta was heavily jeered by local and opposing fans. During her fourth World Cup in 2015, Marta became the all-time top scorer of the women's tournament with 15 goals once she scored the second goal in Brazil's debut against South Korea. Brazil lost to Australia in the round-of-16. Marta competed in four FIFA Women's World Cup: USA 2003, China 2007, Germany 2011 and Canada 2015; and three Olympics: Athens 2004, Beijing 2008 and London 2012; starting and playing every minute Brazil teams played at those six global tournaments; altogether played 30 matches, and scored 22 goals. Marta with her Brazil teammates, finished second at China 2007 Women's World Cup, and won silver medals at 2004 Athens and 2008 Beijing Olympics. A small, quick, yet sturdy and tenacious player, who is regarded by many in the sport as the greatest female footballer of all time, Marta is renowned for her flair, quick feet, and exceptional skill on the ball, which has earned her comparisons with Ronaldinho, Romário, and also Pelé, who himself dubbed her as Pele with skirts. In addition to her vision and technical skills, Marta is also known for her pace when dribbling at speed. Marta is capable of playing in several offensive positions: she began her career in an offensive midfield role as a classic number 10, although she was later deployed in a more advanced role, both as a supporting forward and as a main striker, or even on the wing, a position which allows her to cut into the middle and shoot on goal with her stronger left foot. Although she is primarily known for her creativity, chance creation, and ability to play off of her teammates as an advanced playmaker, Marta is a prolific goalscorer, who is renowned for her striking ability; she is also accurate from penalties and set-pieces. In addition to her footballing abilities, Marta has also stood out for her leadership. Marta has three siblings, José, Valdir, and Angela. Her parents are Aldário and Tereza. Her father left the family while Marta was a baby. As of 2010, she lives in San Jose and is a competent Swedish speaker. On 11 October 2010, Marta was named a UN goodwill ambassador. Marta is fluent in Portuguese and Swedish. She is a Catholic and states that God is very important to her although she does not go to Church that often. She holds dual citizenship for Brazil and Sweden. ^ "2015 World Cup" (PDF). ^ a b "10 Best Female Footballers of All Time". 27 October 2014. ^ a b "Women's World Cup 2015: who is Marta, who is the greatest footballer of all time, Marta, Matildas - Fox Sports". www.foxsports.com.au. ^ a b Panja, Tariq (8 June 2015). "Best-Ever Female Player Marta Misses Soccer's Millions". Bloomberg. ^ FIFA.com. "2018 FIFA World Cup Russia™ - FIFA.com". www.fifa.com. ^ "Nu är världens genom tiderna bästa fotbollsspelare svensk medborgare". ^ "Tabell och resultat – Damallsvenskan". svenskfotboll.se (in Swedish). Svenska Fotbollförbundet. Archived from the original on 12 September 2012. Retrieved 13 January 2009. ^ "Skytteliga 2007". svenskfotboll.se (in Swedish). Svenska Fotbollförbundet. Archived from the original on 25 December 2007. Retrieved 13 January 2009. ^ Wåhlin, Johan (12 January 2009). "Marta bäst i världen – flyttar till LA". dn.se (in Swedish). Retrieved 13 January 2009. ^ "Martas krav till USA: Ta med Frisk" (in Swedish). Fotbollsexpressen.se. 23 October 2008. Archived from the original on 24 October 2008. Retrieved 7 April 2009. ^ "Ekwalls rekord" (in Swedish). Arbetaren.se. 2 January 2009. Archived from the original on 13 November 2010. Retrieved 7 April 2009. ^ "Frisk: Vi är inget par" (in Swedish). Aftonbladet.se. 13 January 2009. Retrieved 7 April 2009. ^ "The Fabulous Forum". Los Angeles Times. 12 January 2009. ^ "Newly crowned Marta to join US league". FIFA. 12 January 2009. Retrieved 15 June 2012. ^ "Marta bringing star power to the L.A. Sol". ESPN. The Associated Press. 5 March 2009. Retrieved 24 April 2014. ^ "Marta! Marta! Marta! : LA Sol Star Named FIFA Women's Player of the Year". Bleacher Report. 22 December 2009. Retrieved 24 April 2014. ^ Herbert, Steven (7 January 2010). "NJ Sky Blue Eclipse LA Sol 1–0 in Championship". NBC Los Angeles. Retrieved 24 April 2014. ^ Adilson Barros (1 August 2009). "Peixe anuncia Marta, que deverá receber a camisa 10 das mãos de Pelé" (in Portuguese). GloboEsporte.com. Retrieved 5 August 2009. ^ "'Sereias da Vila' dão show e Santos é campeão da Libertadores" (in Portuguese). iG. 18 October 2009. Retrieved 2 December 2009. ^ "Santos bate Botucatu e conquista a Copa do Brasil feminina" (in Portuguese). Estadão. 1 December 2009. Retrieved 2 December 2009. ^ womensprosoccer.com Archived 18 July 2011 at the Wayback Machine; Western New York Flash acquire Marta; 25 January 2011. ^ "Marta returns to Sweden with Tyresö". UEFA. 22 February 2012. Retrieved 22 February 2012. ^ "Marta signs with Tyreso FF". bigapplesoccer.com. 22 February 2012. Archived from the original on 27 April 2012. Retrieved 22 February 2012. ^ "Marta's agent in talks with four Swedish clubs Tyresö FF, Malmö, Linköping and Umeå". womenssoccerunited.com. 26 January 2012. Archived from the original on 9 February 2013. Retrieved 22 February 2012. ^ "Marta transfers to Tyresö FF" (in German). womensoccer.de. 22 February 2012. Retrieved 22 February 2012. ^ Cleris, Johannes (3 November 2012). "Tyresö vann SM-guld efter dramatik" (in Swedish). Dagens Nyheter. Retrieved 27 June 2013. ^ Saffer, Paul (22 May 2014). "Müller the hero again as Wolfsburg win classic final". UEFA. Retrieved 22 June 2014. ^ Jönsson, Fredrik; Nordmark, Kasja (5 June 2014). "Tyresö lämnar damallsvenskan" (in Swedish). Aftonbladet. Retrieved 22 June 2014. ^ Bråstedt, Mats (8 April 2014). "Norsk klubb vill ha Marta" (in Swedish). Damfotboll.com. Retrieved 22 June 2014. ^ Bråstedt, Mats (9 April 2014). "Seger och Marta nära en flytt till Paris SG" (in Swedish). Expressen. Retrieved 22 June 2014. ^ "Marta stays in Sweden, signs with FC Rosengård – Equalizer Soccer". ^ Wahl, Grant. "Brazil star Marta signs with NWSL's Orlando Pride". SI.com. Retrieved 20 May 2017. ^ "2017 Orlando Pride Season in Review: Marta". The Mane Land. Retrieved 13 May 2018. ^ "GloboEsporte.com > Pan2007 > Futebol Pan2007 - NOTÍCIAS - Pelé diz que Marta é Pelé de saias". pan2007.globo.com. ^ "US women hope Solo keeps Brazil's Marta from finding the net". Al Arabiya. 10 July 2011. Archived from the original on 1 September 2011. Retrieved 6 September 2011. ^ "Recap: Brazil vs. United States". Retrieved 10 July 2011. ^ "Boos for Marta bemuse Brazil coach Lima". AFP. 10 July 2011. Retrieved 10 July 2011. ^ "Solo soars as Marta is jeered". St Petersburg Times. 10 July 2011. Archived from the original on 10 October 2011. Retrieved 10 July 2011. ^ "FIFA Player Statistics: Marta". FIFA. ^ Lawrence, Andrew (22 December 2009). "2000s: Top 20 Female Athletes". Sports Illustrated. Retrieved 29 December 2009. ^ "Former Results". IFFHS. Retrieved 13 January 2016. ^ Stephanie Nolen (14 June 2015). "A 'vicious circle' plaguing the world of women's soccer in Brazil". The Globe and Mail. Retrieved 16 January 2016. ^ Ashley Gray (30 March 2009). "I have the skill to play in the men's game – people say I'm like Ronaldinho, says world No 1 woman Marta". The Daily Mail. Retrieved 15 January 2016. ^ a b c d e Alex Bellos (3 June 2007). "Chilled to perfection". The Guardian. Retrieved 15 January 2016. ^ "Marta Vieira da Silva (Marta)". The Telegraph. Retrieved 15 January 2016. ^ Bonnie D. Ford (10 June 2015). "Marta's quest for soccer glory". ESPN. Retrieved 15 January 2016. ^ a b Joanne C. Gerstner (24 June 2011). "Ten to watch in Women's World Cup". ESPN. Retrieved 15 January 2016. ^ a b Michael T. Shepard (25 September 2003). "Brazil's Marta Is a 10". The Washington Post. Retrieved 15 January 2016. ^ Paul Saffer (22 April 2007). "Marta ready to work for Umeå". UEFA.com. Retrieved 15 January 2016. ^ "Marta makes latest Swedish move". FIFA.com. 24 July 2014. Retrieved 15 January 2016. ^ Stephen Wade (27 September 2007). "USA 0 Brazil 4: Marta's masterclass humbles US". The Independent. Retrieved 15 January 2016. ^ Reem Abulleil (21 May 2015). "INTERVIEW: Brazil striker Marta aiming to end her long wait for World Cup glory". Yahoo.com. Retrieved 16 January 2016. ^ "US women crash out of World Cup 4–0 to Brazil". The Guardian. 27 September 2007. Retrieved 16 January 2016. ^ "Marta leads Brazil into quarters". The Ottawa Sun. 3 July 2011. Archived from the original on 4 August 2016. Retrieved 16 January 2016. ^ "2003: Magical Marta ups the tempo in the States". FIFA.com. 15 October 2004. Retrieved 15 January 2016. ^ Jeff Carlisle (9 July 2011). "Will the U.S. defeat Marta & Co.?". ESPN. Retrieved 15 January 2016. ^ Rob Hughes (11 January 2011). "The Best Player on Earth Is Looking for a Job". The New York Times. Retrieved 15 January 2016. ^ Paolo Bandini (10 July 2011). "Brazil v USA – as it happened". The Guardian. Retrieved 16 January 2016. ^ Bobby Ilich (6 December 2015). "Women's World Cup 2015: One Foreign Soccer Player Stands Out Above The Rest – Get To Know Brazil's Marta". International Business Times. Retrieved 16 January 2016. ^ "Letter to My Younger Self - By Marta". The Players' Tribune. ^ "Brazilian star Marta to be UN goodwill ambassador". SI.com. 11 October 2010. Archived from the original on 4 November 2012. Retrieved 12 October 2010. ^ L. Jones, Grahame (25 February 2009). "Marta has come a long way, takes on new challenge in U.S." Retrieved 21 September 2018. ^ "Abbey Road – Sunday Guest Marta Vieira Da Silva (English Translation)". Women's Soccer United. 27 February 2012. Retrieved 11 June 2015. Wikimedia Commons has media related to Marta Vieira da Silva. "WPS profile". Archived from the original on 30 June 2011. Retrieved 4 June 2011.